Rural Retreats opens the door to all there is to explore in the UK and Ireland. Its properties span the length and breadth of the country and include cottages, bungalows, lighthouses, converted farmhouses and much more. You could enjoy a stay in a secluded orchard, among rolling hills or in a luxurious beachside apartment. With so much choice, it’s good to know that Rural Retreats’ telephone team can advise on all the properties to make sure you find the getaway that’s right for you. Flexible booking dates mean there is no compulsory stay period or start/finish day and late checkout is available on weekends to help you make the most of your trip. Absolute comfort is at the heart of Rural Retreats: on entry into the property you’ll find fresh linen and towels, a bottle of wine in the fridge, a welcome hamper full of treats and you’ll even receive a phone call from the housekeeper to ensure you’re settling in. Whether it’s a romantic break for two, a holiday for family or friends or even a working break, Rural Retreats gives you the holiday home you deserve. How do I use my Rural Retreats voucher code? Check out the Offers & Promotions page on Rural Retreats to find some great deals. Can I change my rental period at Rural Retreats? Yes, though you will be liable to pay a £41 administration fee on top of the higher price you may have to pay for an extending your stay. What utilities are included in the price at Rural Retreats? There is no charge for heating, electricity, gas or solid fuel. Broadband or WiFi is free where available. Use of the telephone is payable. What are the leaving and arrival times at Rural Retreats? Rentals generally commence at 4.00pm on the day of arrival and end at 10.00am on the day of departure. Late departures (until 6pm) are available on some rentals for a fee. Cancellation charges are payable depending on when you cancel. Deposits are always non-refundable. ‘Booking Protect’ insurance is available to protect you against any changes of plan. These days you don’t have to go abroad to get away from it all, and Rural Retreats has an amazing array of luxury cottages and houses in the idyllic settings of rural UK. A Rural Retreats voucher code could save you money off your next booking, so you could get yourself a well-deserved homegrown break for less. With properties in Cornwall, Devon, Wales, Ireland and more, you’re sure to find a gorgeous setting for your holiday. You’ll be spoiled for choice at Rural Retreats with its huge variety of locations and property types. There’s even a handy inspiration guide to help you narrow down your options. If you’re looking for a city break, historic retreat or honeymoon cottage, it’ll help you find what you need. Equally, if you’re after something dog friendly, baby-appropriate or suitable for large groups, Rural Retreats can help you pick out the perfect place. We love a slice of the Cornish life here at vouchercloud. From Bodmin Moor to the Eden Project, Tintagel Castle to Porthcurno beach, there’s so much to see and do. 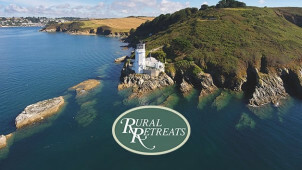 A Rural Retreats discount code could save you money on your next booking, so you can enjoy a relaxing Cornish holiday for less. With a huge range of properties in the region, you'll be right in the heart of this glorious county.